If you follow me on Twitter then you may have spotted my tweet a few weeks before Christmas mourning the death of my trusty old GHD's. I started straightening my hair as usual, holding the straighteners between my knees while I was separating the next piece of hair when I heard a crackling sound. I quickly picked them up and bent down to unplug them when they sparked with a little puff of smoke and they were no more. At least they weren't still between my knees though as that would have been my second electrocution of the year! Just a few weeks before my laptop charging cable did exactly the same thing, electrocuting me and resulting in my first ambulance. It didn't throw me across the room or anything though, the ambulance was just really a precaution because my arm felt strange afterwards and they wanted to check my heart as I have a very slight issue with it. Anyway, back to straighteners. I had managed to pick up a cheap set that were reduced in Superdrug to tide me over but they're not a patch on my GHD's. 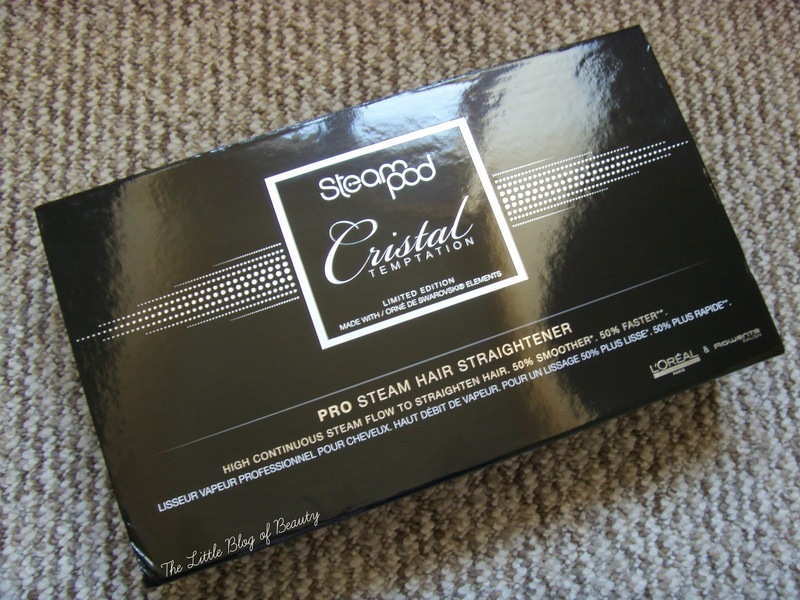 So when an email popped into my account a few weeks ago from L'Oreal asking if they could send me their Cristal Temptation Steampod straighteners* I was over the moon. This is going to be a long post so you may want to grab a drink and a snack! The straighteners consist of the straighteners themselves and then an attached Steampod (and of course the power cable). The only other things included in the box are the instruction manual and a PH testing strip to test your water. The straighteners have an on/off button and a + and - button to adjust the temperature. There's an electronic screen on the top to show the temperature and when the straighteners are 'locked' (so you can't accidentally press a button and change the temperature) and the top of the straighteners light up around the screen and down around the crystal decoration. The bottom of the Steampod has suckers on so as long as you've placed it on a smooth surface you don't need to worry about pulling the cable and tipping it over because it suckers in place. The straighteners basically work like a steam iron. 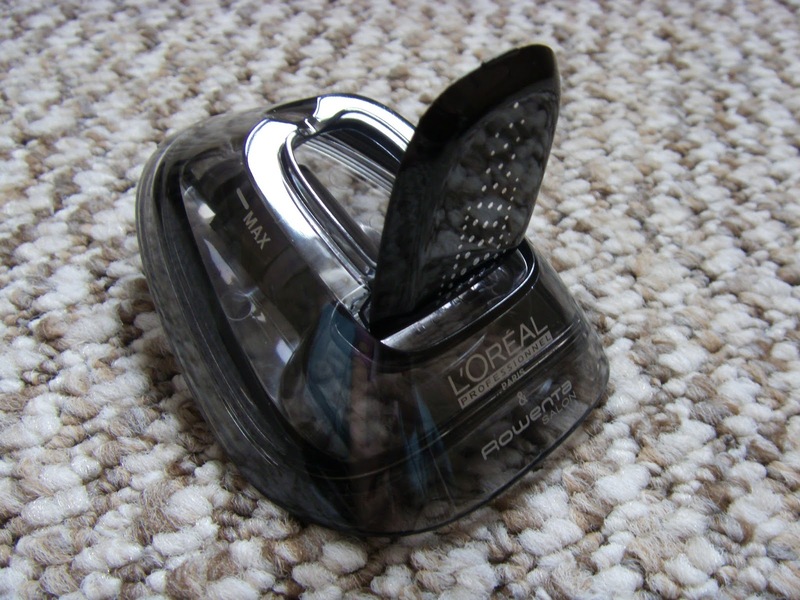 The top of the Steampod detaches and you fill this with water before clicking it back into place on the Steampod. However first you need to test the PH/hardness of your water to make sure that it's suitable to use with the Steampod. If your water is too hard (over 9F) you're advised to buy demineralised water to use with it. You're provided with a PH strip that you have to dip into a cup of water before leaving it for 60 seconds. The strip has five pads on it which you really want to turn green, the more pads that turn red the harder your water is. One red pad means the hardness of your water is 9F at the most. On mine just the very edges of the second pad had turned red so I decided if anything my water is just slightly over 9F so I've decided to go with using my water in the Steampod. So you pop some water in the Steampod and turn them on using the button on the straighteners. You then set the temperature you want between a range of 170C to 210C depending on how fine/thick and fragile your hair is. I have to admit I'm not entirely sure what heat I should be putting them on for my hair. It's in good condition but I don't know whether it's fine or normal, so I went for 200C which covers fine (thickness)/normal (damage level) and normal (thickness)/fragile (damage level). The straighteners take 90 seconds to heat up, which sounds about right, and are supposed to take 90 seconds for the steam to start but I would say this does take longer. The first time I used them I actually thought something might be wrong with them as I had to wait maybe five minutes plus for the steam to start coming out (Note - I've just read a bit in the manual that I must have completely missed when I first read it saying to hold the straighteners closed the first time you use them to start the steam after 90 seconds!). The second time it seemed a little quicker, but still not 90 seconds, although the third time it did seem much quicker. In the manual it says you must be able to see the steam coming out and hear the noise of the steam to use the straighteners. I'm not sure why this would be the case as surely you could use them without the steam, but if the steam runs out you're supposed to refill the Steampod reservoir. The sound that the steam makes sounds just like the sound a steam iron makes, a kind of a puff noise. 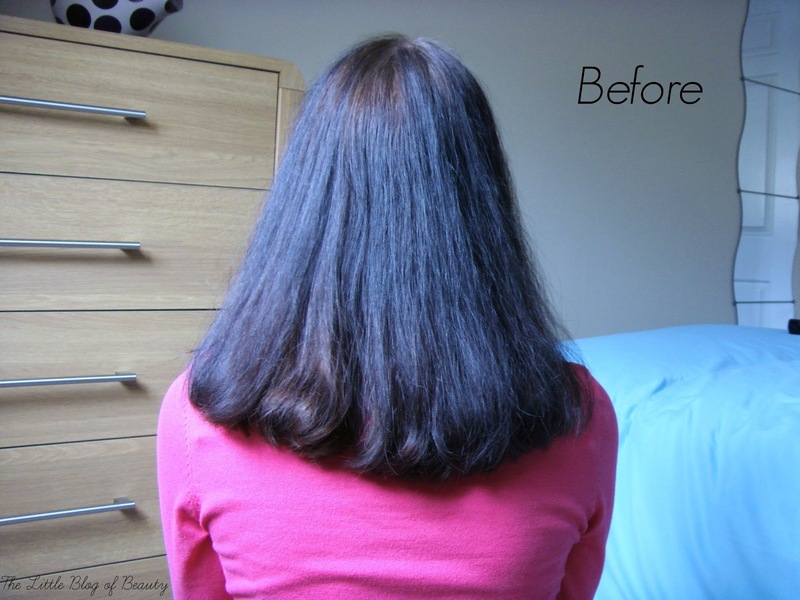 To use the straighteners you take a section of hair, clamp the straighteners firmly at the root of the hair (this starts the steam) and then slowly run the straighteners down to the ends so the steam can spread through the hair. The arrows on the top of the straighteners indicate which way round they have to be moved through the hair. At first I got all cack-handed because I naturally use straighteners facing outwards and I was concerned that this would mean the steam was puffing towards my head and it might burn. This isn't a problem though as I think the part where the arrows are blocks the steam. 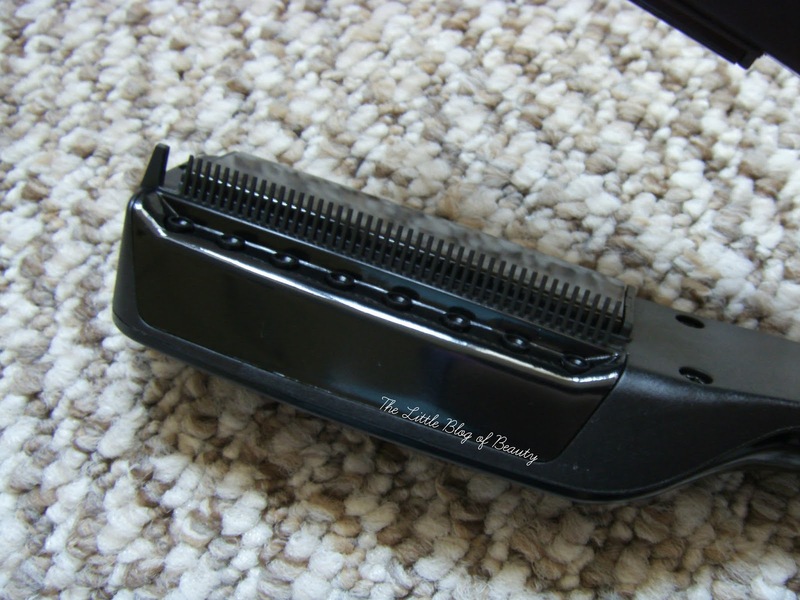 As you can see from the pictures this does include a built-in comb so I would recommend combing through the section of hair you're about to straighten or obviously any knots will catch in the comb. It's only when I try to take pictures like this that I realise how bad the curve at the top of my spine is! I had to make sure I held my head back so I didn't look like a complete hunchback. Please also excuse my roots/slightly patchy dye job. The first photo shows my hair left to dry au naturel with a quick blast of the hair dryer as I was impatient and the second shows my hair after using the straighteners. I'm not very good at getting the ends straight, I always seem to tilt the straighteners slightly at the end of my hair and end up with a slight flick. However I'm very pleased with the results. 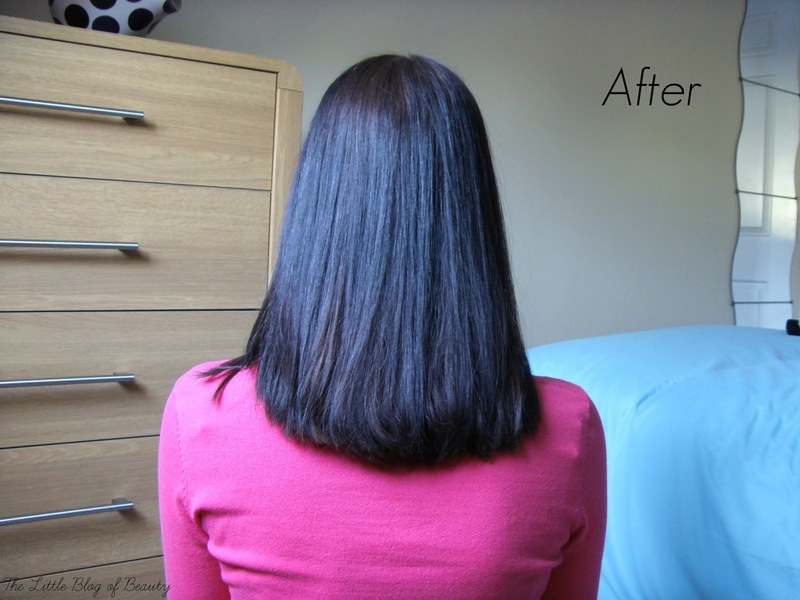 I'm not sure that it was any quicker than my usual straighteners but my hair did feel softer and looked a little healthier and shinier than it usually does. I used these for the third time last night and did a much better job of getting the ends straight and I love how my hair looked. There are a few things that I think you need to bear in mind if you're considering investing in these straighteners. Firstly, prices appear to range between £109 and £150 for the standard version and the limited edition Cristal Temptation version, which is what I have here, appears to be £150. So they're on par, if not slightly more expensive than GHD pricing. The Cristal Temptation version is available now but the standard version doesn't appear to be released for another week or so. These don't come with any kind of heat resistant mat which I think you really do need. The outside of the straighteners near the plates gets very hot and there's no way to put them down without a hot part touching whatever surface you put them on. You won't be able to curl your hair with these because of the comb and the shape of the straighteners due to the steam part, so they're just for straightening. Also as I mentioned above if your water is too hard to use with these you will need to buy demineralised water to use with them, which might not be ideal. Finally these aren't ideal for travelling as they're quite bulky and take up a lot of space and don't come with any kind of pouch or bag to store them in. They're definitely ones that are best for use at home. So would I choose these over GHD's? It's very close. In my current circumstances I would go for GHD's because of their portability, but once I have my own house and can stop flitting between my parents and my boyfriends I think I would go for these. I think as long as I knew about it beforehand I would check the water in my house and my final decision would probably depend on that. I did also receive a couple of L'Oreal styling products to use with these but I haven't tried them as of yet as one of the products doesn't have any English instructions on it, so I'm not sure how to use it. Researching for this post I discovered that you are apparently supposed to use one of the products with the straighteners. So I will look for English instructions online and report back in a separate post. It's worth noting that the Steampod styling products are £16.50 each. 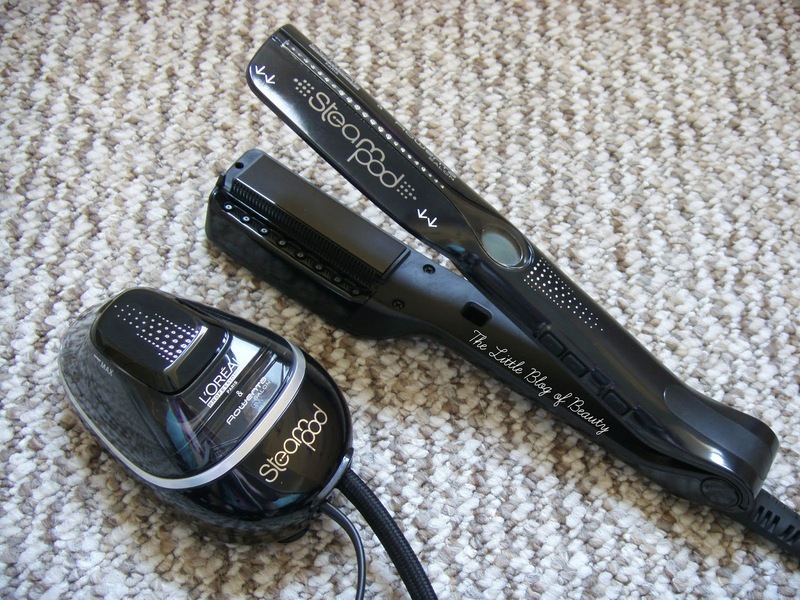 You can out more about the L'Oreal Professional Steampod straighteners here. Are you still with me? *tumbleweed* If you are, would you invest in the Steampod?